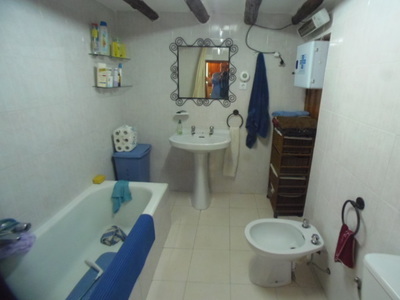 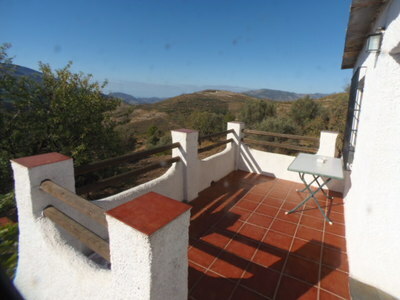 orgiva lanjaron complex retreat for sale Las Alpujarras - Granada - Andalucía- Spain - - HomesEspana Orgiva Property Real Estate Agent Inmobiliaria Since 2003 UA-39695354-1 HomesEspana Orgiva Real Estate Agent Inmobiliaria In Orgiva and lanjaron for Properties In The Alpujarras-Granada-Andalucia-Spain. 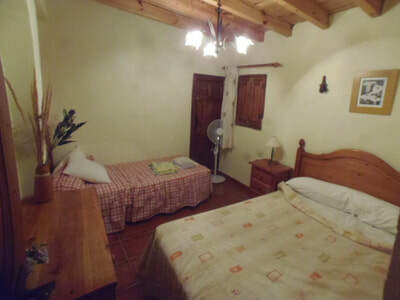 The finca is located about 3km from Orgiva and reached by 400m of track from the main road between Orgiva and Lanjaron. 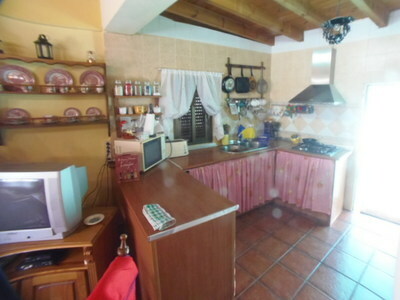 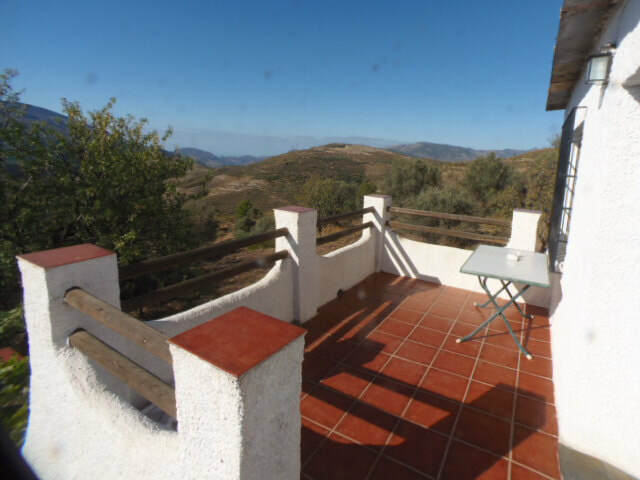 It is set on a south facing hillside with grand views of the Sierra Lujar and the Guadalfeo valley. 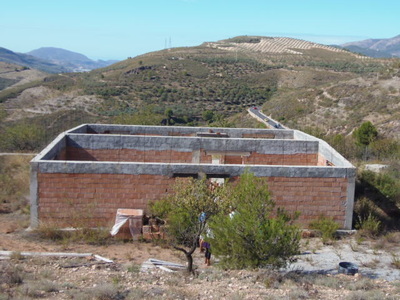 On more than 14Ha of land (classified as mostly dry almond and pasture) are two - two-storey houses and one unfinished building. 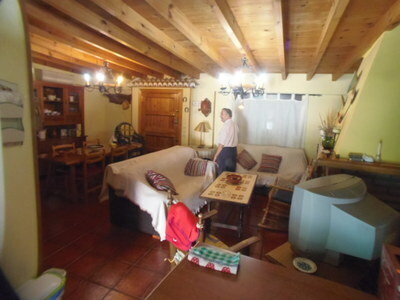 The larger of the houses has a 100m2 Footprint. 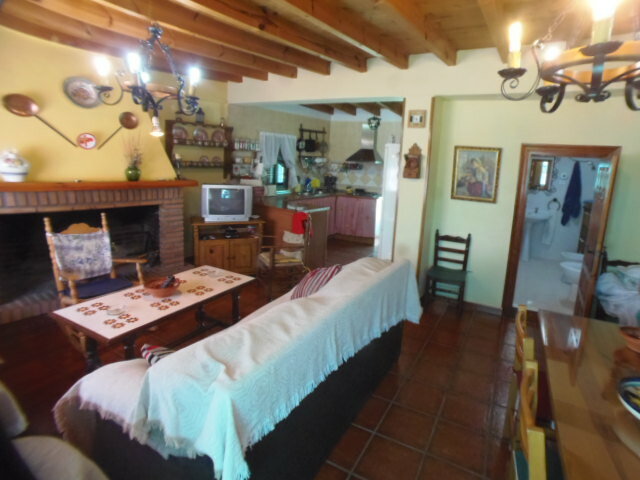 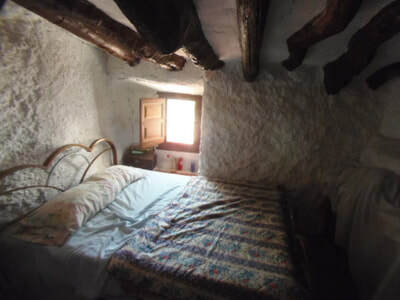 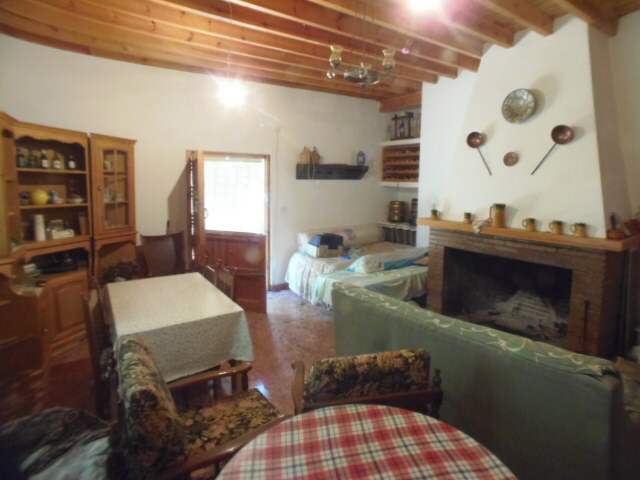 The lower level is an old cortijo with thick walls, beams and low ceilings, with two bedrooms, a kitchen and a living room. 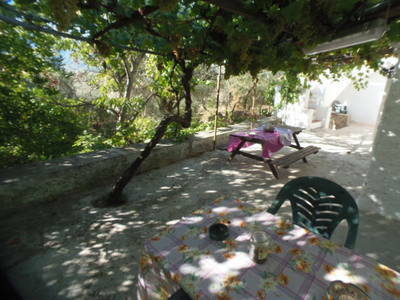 In front of it is a large terrace shaded by an extensive vine. 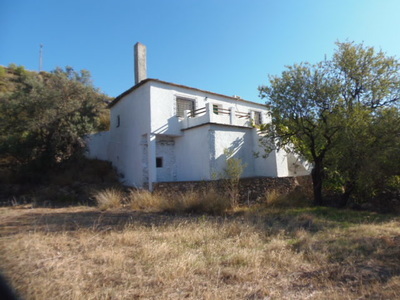 The upper level is recently constructed of modern materials, and is reached by steps from the terrace, or by a door opening from the upper level to the hillside behind. A large living room with open-plan kitchen opens onto a terrace with grand views; there are two bedrooms with twin beds, a bedroom with a double bed, and a bathroom. This level has air conditioning. 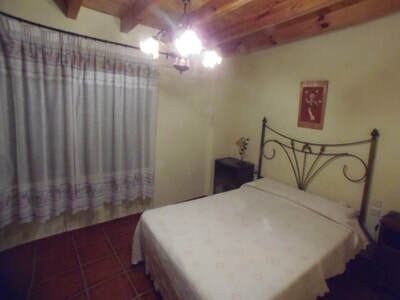 Fifty metres away is the smaller house, by the pool terrace with a 65m2 Footprint. 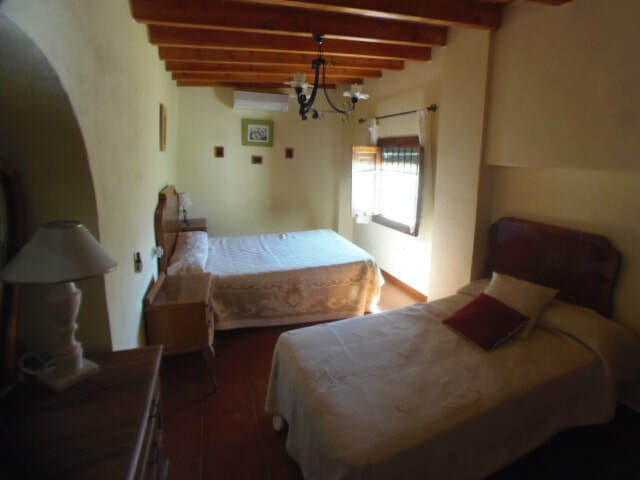 The lower level is a large garage-storeroom, which could be converted in to 2 bedrooms bathroom and the upper level consists of a large living room with fireplace, opening onto a terrace with shading walnut tree. Directly adjacent to this house is a large (12m by 6m) swimming pool with filtration-pump-skimmer system, with surrounding patio. 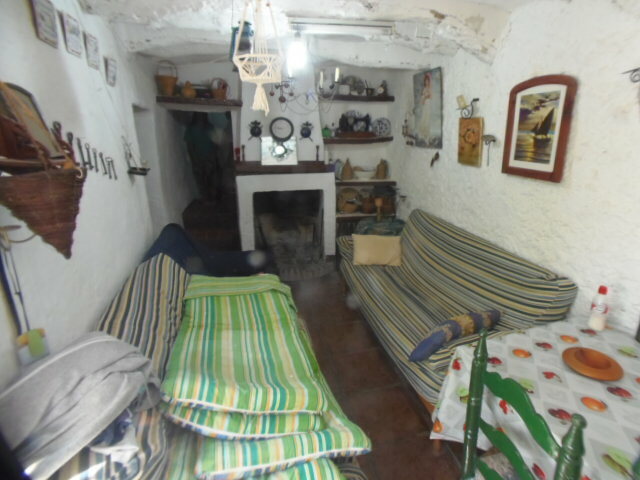 About 70m away in the other direction is a large old stone threshing floor, which would make a beautiful patio, with fantastic views to the south. A large unfinished building of excellent construction and footprint of 120m2 Is located 150m west of the houses? 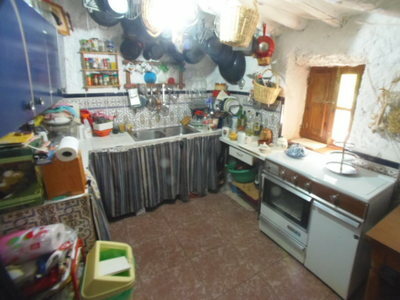 It is designated an agricultural building (nava), but a change of use could be applied for. Around the houses are some 140,000m2 Of land is terraced and planted with olive, walnut and diverse fruit trees. 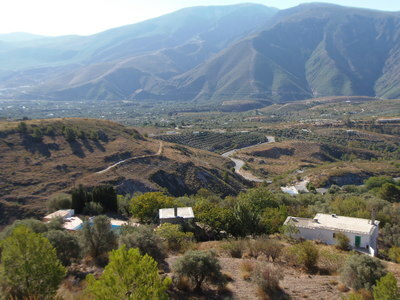 Although the finca has electricity connected, it is too far from Orgiva to have municipal water, which for domestic use and irrigation is supplied by a spring on the land, shared with a neighbour, which fills a 100,000 litre covered cement water deposit. 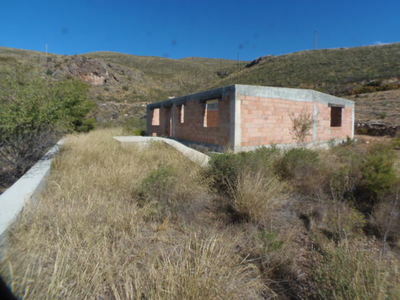 An additional source of water is the acequia (water channel) Mezquirina, which is used for occasional irrigation There is a septic tank for sewage. This property finished would make a great holiday centre in the country side but very close to orgiva and lanjaron towns or add yurts wood homes possible.